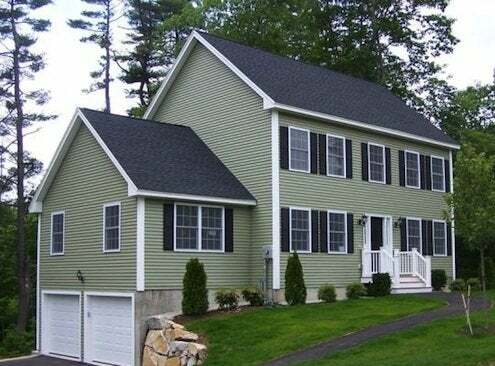 The growing popularity of vinyl siding is indisputable. Indeed, U.S. Census Bureau statistics indicate that vinyl siding has been the leading exterior cladding in the U.S. since 1995. Its popularity shows no sign of waning; in 2011, 33% of new single-family homes sold in the U.S. were sided in the material. Still, that doesn’t mean homeowners know how to clean vinyl siding—and keep it clean. According to the Vinyl Siding Institute, the best way is to use a soft cloth or an ordinary long-handled, soft-bristle brush. To prevent streaking, start at the bottom and work up towards the top of the house. When cleaning vinyl siding, remember to thoroughly rinse away any residue as you go. 70% water, 30% white vinegar makes a great all-purpose vinyl siding cleaner that removes light mold and mildew stains. For a stronger solution, mix together one-third cup powdered laundry detergent, two-thirds cup powdered household cleaner, one quart liquid laundry bleach and one gallon of water. General household cleansers (e.g., Fantastik, Murphy’s Oil Soap, Windex and Lysol) can be used on tough dirt and stains, and including those created by top soil, grass, grease, oil, rust, crayon, ink and bubble gum. Rust stains may be removed using products designed for this purpose (e.g., Super Iron Out and Instant Rust Out). Cleaning vinyl siding is even easier with a pressure washer, although some manufacturers advise against it, and other manufacturers recommend a limited amount of pressure. 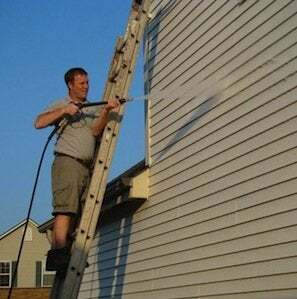 If you’re not sure how to clean vinyl siding with a pressure washer, start by ensuring that the stream is at eye level and pointed straight at the siding, not at an upward angle. That way, you won’t drive water behind the siding. Use caution when using a pressure washer around openings like windows, doors, and plumbing connections. Avoid using any vinyl siding cleaners that contain organic solvents, undiluted chlorine bleach, liquid grease remover, nail polish remover, or furniture polish or cleaners. Any of these products might damage the vinyl siding’s surface. Also, avoid using highly-abrasive scrubbers or steel wool; these, too, can cause damage when cleaning vinyl siding.